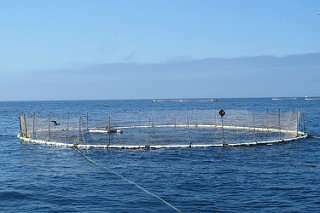 A new analysis suggests that open-ocean aquaculture for three species of finfish is a viable option for industry expansion under most climate change scenarios – an option that may provide a new source of protein for the world's growing population. Results of the study are being published this week in the Proceedings of the Royal Society B. "Open-ocean aquaculture is still a young and mostly unregulated industry that isn't necessarily environmentally sound, but aquaculture also is the fastest growing food sector globally," said James Watson, an Oregon State University environmental scientist and co-author on the study. "One important step before developing such an industry is to assess whether such operations will succeed under warming conditions. "In general, all three species we assessed – which represent species in different thermal regions globally – would respond favorably to climate change." Aquaculture provides a primary protein source for approximately one billion people worldwide and is projected to become even more important in the future, the authors say. However, land-based operations, as well as those in bays and estuaries, have limited expansion potential because of the lack of available of water or space. Open-ocean aquaculture operations, despite the name, are usually located within several miles of land – near enough to market to reduce costs, but far enough out to have clean water and less competition for space. However, aquaculture managers have less control over currents, water temperature, and waves. To assess the possible range for aquaculture, the researchers looked at three species of fish – Atlantic salmon (Salmo salar), which grows fastest in sub-polar and temperate waters; gilthead seabream (Sparus aurata), found in temperate and sub-tropical waters; and cobia (Rachycentron canadum), which is in sub-tropical and tropical waters. "We found that all three species would shift farther away from the tropics, which most models say will heat more than other regions," said Dane Klinger, a former postdoctoral researcher at Princeton University and lead author of the study. "Production of Atlantic salmon, for example, could expand well into the higher latitudes, and though the trailing edge of their range may face difficulties, adaptation techniques can offset those difficulties. "Further, in most areas where these species are currently farmed, growth rates are likely to increase as temperatures rise." Open-ocean aquaculture is not without risk, the researchers acknowledge. The recent escape of farmed Atlantic salmon in Washington's Puget Sound alarmed fisheries managers, who worry that the species may breed with wild Chinook or coho salmon that are found in the Pacific Northwest. Introduced species and populations also have the potential to introduce disease to native species. "A key unresolved question is how large the industry and individual farms can become before they begin to negatively impact surrounding ecosystems," Klinger said. The authors say their modeling study was designed to assess the potential growth rates and potential range for the three fish species, based on climate warming scenarios of 2-5 degrees Celsius (or 3.6 to 9 degrees Fahrenheit). Other factors dictating success include environment, economics (feed, fuel and labor), regulations and politics, ecology (disease, predators, and harmful algal blooms), and social norms. "Offshore aquaculture will continue to be a small segment of the industry in the near-term, but there is only so much you can do on land and there are not enough wild fish to feed the world's population," Watson said. "Assessing the potential is the first step toward reducing some of the uncertainties for the future."